Borage plants (Borago officinalis is pictured right) are a widely grown from seeds, and are a herb originally from Syria. Used widely both as a medicinal herb and a culinary herb plants and seeds are available for purchase online from specialist nurseries by Mail Order. 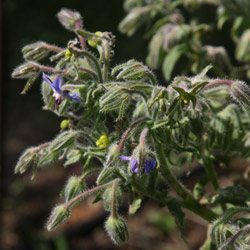 The pretty blue flowers that appear in spring are attractive and given a sunny position Borage is generally easy to grow. It will die right back in winter to reappear as spring warms up,the soil. Easily grown from seed sown directly or into seed strays in late winter, and it will self seed if left. Preferring a free draining soil and a sunny position remove flower heads before seed sets to prevent spreading if required. Also used as a cottage garden plant. This is a plant that can also be used as a fertilizer, the whole plant can be soaked in water and the resultant ‘tea’ be used as a liquid fertilizer. Borage has a long tap root and therefore is difficult to transplant once established, smaller seedlings are best for transplanting.